"The Pinball Classifieds have a lot of tips on their website." Here is a list of tips for repairing or restoring pins. As the list grows, I'll create separate pages and new categories. I plan to database tips and make them searchable in the future. For now, I just wanted to get the page started. 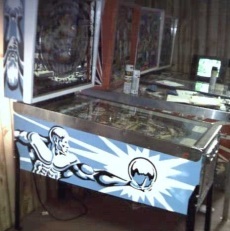 Note that there is a large list of repair tips on the Mr. Pinball Site.. It is probably the largest list on the internet. Take Pictures: When doing a repaint, be sure to take pictures before you strip the cabinet. Even though your stencils should have enough information on them to help you place them correctly, having a picture will help. There is just something re-assuring and helpful about having the picture in front of you. Recreating the Webbing or Splatter Pattern on Gottlieb Games: Gottlieb games had either a webbing splatter or a dotted splatter depending on the era. You can re-create both using a child's plastic arts and crafts paintbrush. Whichever pattern was used, it was applied after the base color but before the two scheme colors. The dotted pattern can be made by lightly flicking the paintbrush with its head full of paint. Use your index finger to "flick" the brush, similar to kicking a paper football (just don't use that much force). The webbing pattern can be recreated by pulling the brush back and letting it rebound forward. The plastic paint brush will bend and then "snap" forward. This action causes the paint to fly off in a webbing pattern. You can experiment using cardboard to figure out how much paint is required on the brush and how hard you need to flick or bend the paintbrush. Mylar Removal Method 1: Get a small portion of the mylar to lift up by using Goo Gone and an exacto knife. Once you have a small portion lifted, get a can of compressed air and turn it upside down and spray under the uplifted portion. While spraying, s-l-o-w-l-y pull the mylar up. The compressed air will act like a freeze spray and breakdown the glue holding the mylar. This has been the easiest method for me. The only down side is that it tends to leave more glue residue on the playfield which you will have to remove using Goo Gone and elbow grease. Mylar Removal Method 2: Instead of using freeze spray, you will use hot air to break down the glue. Again, get a portion of the mylar to peel using Goo Gone and an exacto knife. Then squirt Goo Gone under the lifted portion. As the Goo Gone is working to break down the glue, use a hair dryer to heat the mylar. Don't keep the heat on too long as this can result in breaking down the paint. Slowly peel the mylar up as the Goo Gone and heat break down the glue. For me, there is less residual glue after using this method, but accidentally removing paint seems to be riskier this way. Check Fuses Before Tunring on an Untested Game: Before turning a new game on that you may not have been able to test, be sure to check all of the fuses to make sure someone hasn't over-fused the line. Install a Remote Battery Holder: On older solid state games, remove any on board batteries and install a remote battery holder to prevent acid damage. Free Circuit Board Removal Tool: This is one I have taken advantage of. I originally learned this on the Mr. Pinball tips site. Women's shoes often come with a plastic insert in the shoes that is in the shape of a tube. This insert is just the right size to fit the stand-offs for the circuit boards. You can never have too many of these as they are easy to misplace and get thrown away by accident. So, the next time your wife, daughter, or girlfriend buys shoes, check to see if one of these plactic tubes is in the shoes. Removing a Broken Lamp: There are three ways I have removed broken lamps. At times, I use needle nose pliers (with the game off of course) and grab the edge of the lamp and rotate. Second, I have used an eraser that kids buy to put on the end of a pencil. Just put the open end in or around the lamp base and twist. Third, you can take a piece of potato and push onto the broken lamp and then turn. One of these three should get a broken lamp out without cutting your finger. Place a Towel in the Bottom Cabinet: When working under the playfield of an EM game, place a towel over the components in the bottom of the cabinet. That way, when (not if) you drop a screw or other small part, it will land on the towel and not get lost in or under the relays, motors, and stacks of switches in the bottom of the cabinet. BTW, this isn't a bad tip for solid state games either. Even though they don't have a lot of parts or places for things to get lost, it's amazing how many times a screw will fall and just happen to find its way under whatever parts are located in the bottom of the cabinet. Lift Playfield All the Way Up: When raising the playfield, don't use the single stand located inside the cabinet to prop up the playfield as this tends to twist the playfield over time and usually doesn't raise it high enough. Usually it is best to just lean it against the head. I usually place a towel in the area where the playfield touches the head so that it won't scratch the head. Lock-Down Bar Gasket: If you need to replace the rubber seal on a lock down bar, you can buy a rubber screen door seal from any hardware store and use it. It usually comes in a roll and has a sticky side covered with plastic. Cut to size and then remove the plastic and stick to the underside of the lockdown bar. I have restored two Strikes and Spares machines. The second one was in really rough shape. On it I had to find a better playfield and do a playfield swap. 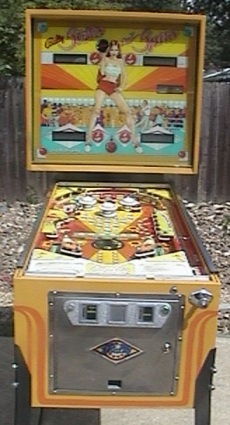 Silverball Mania was the first game I restored.